That was before the phonecall on Friday afternoon to tell me my son was being sick everywhere. Ok, it might be something, but usually nothing. Which resulted in about 2 hrs sleep and a couple of pounds lost. So 2 days left in the month, I need to get one more decent ride in. last nights ride was a repeat of the shaken and stirred ride last week. It was the first time i’d had chance to try the pedals/chain/cassette combination since fitting them. It was a good ride with a couple of minor issues, one was part of a bush getting trapped in the rear wheel, which was soon resolved. Another was the rear mech winding up on occasions, I think there may be a link or two too many in the chain and i’ll sort that out. Things i’ve learned from the ride are – Time ATACs are much nicer than SPDs, there’s a nice solid click when engaging the mechanism, but you have to be smooth when engaging. You can’t stamp on the pedal like you can with Shimano’s offering and hope for the cleat to engage. Also, my tyres are too narrow. even thought they’re 1.95″ compared to 2.0″ the difference is incredible. The bike is very nervous over cobbles and changes direction far too quickly. 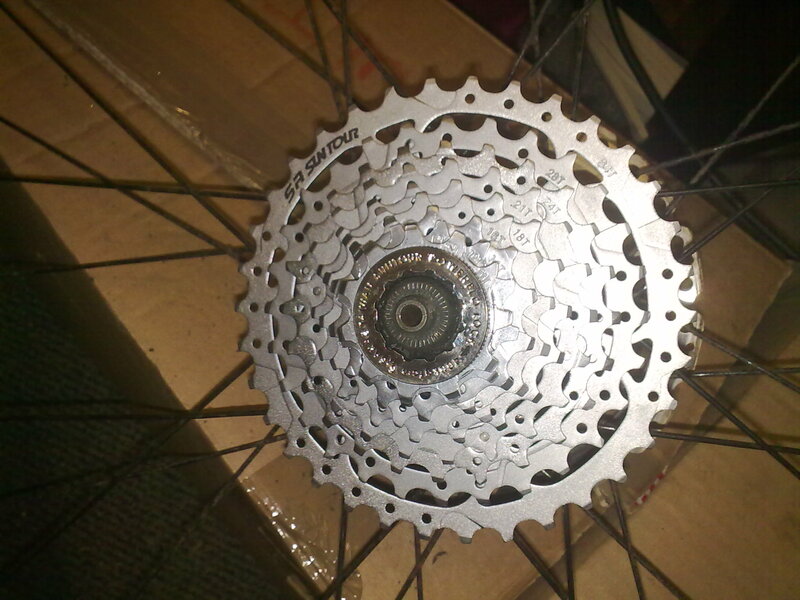 Oh, and a 34 tooth rear cassette is very very spinny! It may come in useful on some climbs, but not last night. I was a bit late getting out tonight as I was on brownie duty. I still hadn’t got round to sorting my bike out, so I jumped on the merlin. Totally forgetting there was no rear break I set off. Now, I don’t know if it was because I had late tea or i’ve overdone the cycling a bit, but my legs had no energy at all. 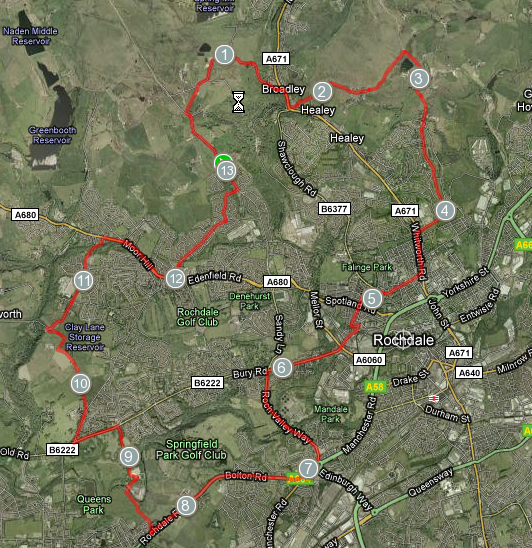 I did a loop down through healey dell and then up edenfield rd into Norden and back along Caldershaw Rd. Not quite what I hoped for, but it’s still mileage. 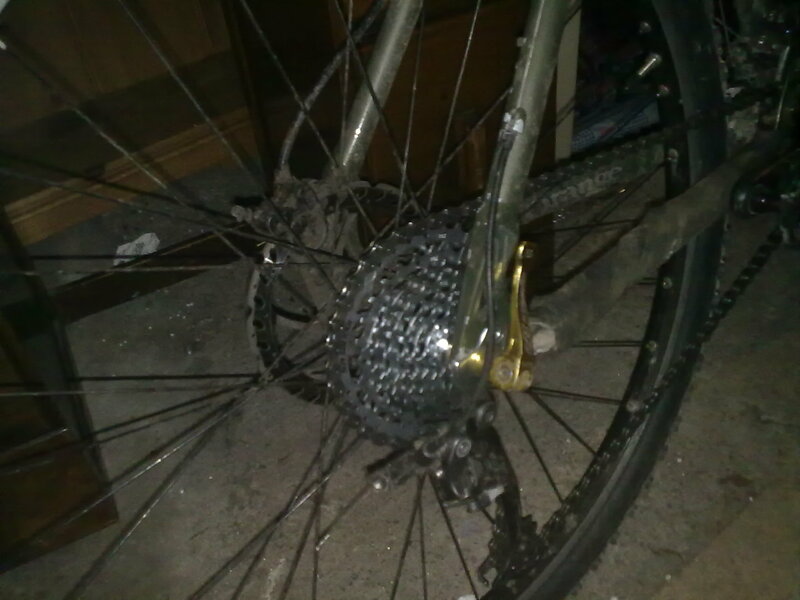 when I got home I replaced the casseette, gear hangar and chain on my bike. The mech looks a bit straighter now I bent the cage back into shape. Tomorrow evening’s ride is cancelled due to baby sitting duties, so I’ll go out tonight and get some road mileage done. The Merlin needs the rear brake fettling before I go out, but that’s just a case of adjusting the pad position on the v-brakes. Alas, it wasnt’ to be.. As happens I had less time free, so I did a quick loop through Healey Dell and up Edenfield Road. Interestingly (for me), I found the climb up Edenfield road quite a slog tonight but when I got to the top I noticed that i’d been on the big ring all the way, so not too bad. 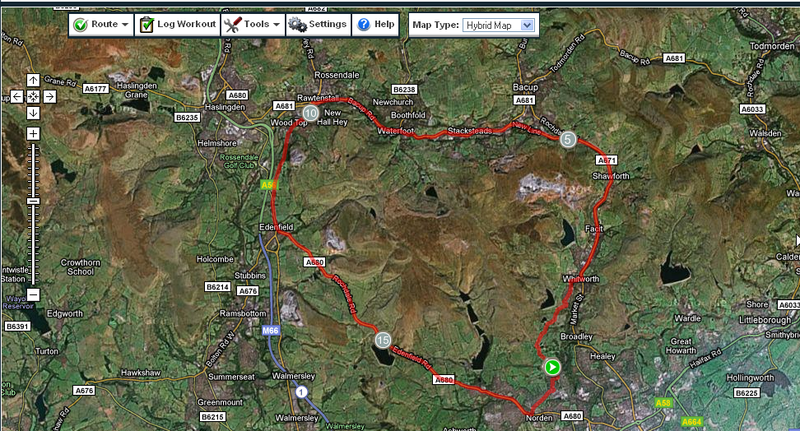 Today’s ride we opted to head off over to Watergrove and loop back via Whitworth. I was using the Merlin again as mine us awaiting spare parts. Met up with Steve and Mike and started the ride. The rear brake was rubbing all the way and the gears would only shift down to the middle ring, so I was going to have to work a bit harder on the climbs. We dropped down through prickshaw and healey dell, before the steep but fairly short climb up Ending rake took us onto open moorland littered with rocks from old quarry workings. We followed the track as it snaked towards Wardle, before turning left and climbing up a narrower stretch that took us towards watergrove. I knew that the track to the left at the crossroads would take us towards lobden but that was going to be the way home. Steve turned right and I think we should have turned left a little further down the track but we missed it and ended up at Syke common. Not what we’d planned, so we re-routed and cycled down towards heywood and cut across crumble lane. A quick diversion along jowkin lane and I was home just short of 1hr 45 after setting off. I can’t wait to get mine back on the road, so to speak, as it’s nowhere near as nervous as the merlin. I planned a nice ride for tonight to recce the weekend ride to Watergrove. I set off and no matter how hard I tried I couldnt get my feet to engage with the pedals. Not a problem as they’re bigger thanthe old shimanos and acted like mini platforms. No issues with chain slip either, so really pleased with that. The drop down from Prickshaw was tricky as I found the narrow tyres i’m running at the moment are roughly the same width as the gaps between the cobbles. And… My brake pads wore down to pretty much metal to metal on the front.. OK, i’ve got the rear brake that’ll be ok. I continued and climbed out of Healey Dell to Whitworth and then climbed up Ending Rake without any issues at all. 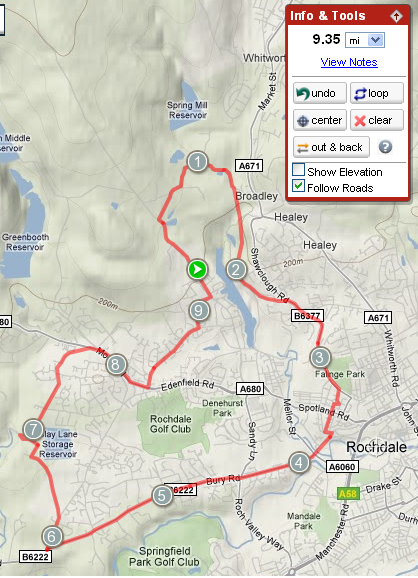 Middle ring all the way, before turning off back towards Whitworth. No. Rear Mech hanger sheared off. I was pedalling along the flat, at a decent rate, no chain slip, but a fair amount of effort in the pedalling department. Unfortunately the rear mech managed to spin round and has bent the cage, but it’s repairable I think. 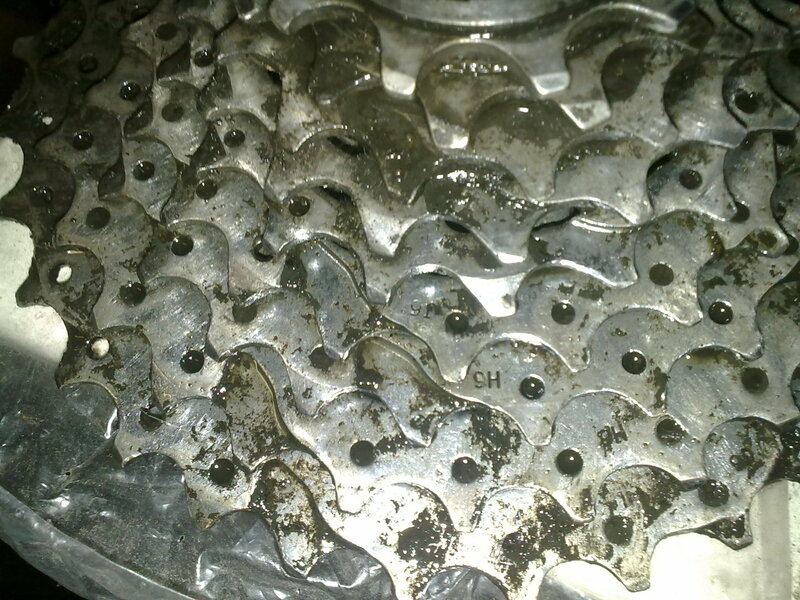 The KMC chain is going in the bin and i’m going to stick with SRAM, and get a new rear cassette too. Just in case. Of course, I then had to free wheel the bike home, including a run up to the top of Prickshaw Lane whilst pushing the bike. This mornings ride was quite an interesting ride, thanks to a number of things. I had initially decided that I would ride over rooley moor to stacksteads and then either come back via edenfield or whitworth. The new tyres that I fitted yesterday had much better rolling resistance but I found them to be a bit skittish. Got to lane head at 8.30 and realised that I really couldn’t be bothered with the climb and went off towards prickshaw and then turned off towards broadley down the pbw. There are a few sections that are quite rough and icy, so I decided the best bet would be to unclip and carefully navigate this section. Right foot unclipped ok but before I had time to do the same with my other foot, I lost my balance fell to the left and slammed down onto the stone slab with my knee. Ouch. I waited a moment before continuing down towards the bridleway and over to Whitworth. I fitted a new chain this week and despite the rear cassette being as new I really struggled with chain slip. The good thing about this was that I couldn’t use the small chainring and had to do ALL the climbs on the middle. A road route was decided on and I rode up through Shawfort and Britannia before dropping down past lee quarry and Waterfoot and the long ride back. Generally it was a great ride, it would have been a bit quicker if I had the use of the big ring and I hadn’t stopped to offer my tyre levers to a roadie with a punctured tyre. No idea about max speed as my phone had insufficient charge to use the gps. Thanks to Phill for pointing this one out.. Quite a good site for analysing your site and creating a cloud. I think there’s quite a common theme running through mine..